We had a family getaway over the weekend to Innisbrook Golf Resort, home of the PGA Tour Valspar Championship. I was first introduced to Innisbrook earlier in the year when I came out for a press trip prior to the tournament. We sampled food from many of their restaurants and I left impressed, looking for an excuse to go back. Innisbrook Golf Resort is located in Palm Harbor, an easy 40 minute minute drive from Downtown Tampa. The kickoff to our getaway was dinner at Innisbrook's Packard's Steakhouse. I recalled this restaurant as having the best grilled lamb lollipops on earth and was looking forward to this meal all week long. We did not order the lamb this go around but my memory served me correct with how amazing the food is. Normally I wouldn't write about bread but exceptions happen and this is one of them. The loaf of hot sour dough was accompanied by olive oil and two homemade butters - Lime Caper and Cherry Vanilla. I had to push the bread to my husband in fear I would eat the entire loaf. We split a Signature Packard's Salad ($13) to kick off our meal. The signature has mixed field greens, candied pecans, boursin cheese, shredded carrots, tomatoes (which we left off) , dried cranberries and a Cabernet Dijon dressing. THAT DRESSING. I could eat salads breakfast, lunch and dinner if I had the recipe. It was a wonderful light summer salad and the perfect way to start our delicious meal. My husband ordered the Prime NY Strip, being it was Executive Che Andrew Coniglio's favorite item on the menu. Gabe is still talking about this steak today, that it was amazing and probably one of the most tender NY strips he has ever had. He compared it to the tenderness of a filet with the flavor of the fat NY Strips have. All Innisbrook's steaks are hand cut and come with a house made red wine demi glace (unless you opt for a enhancement like I did). 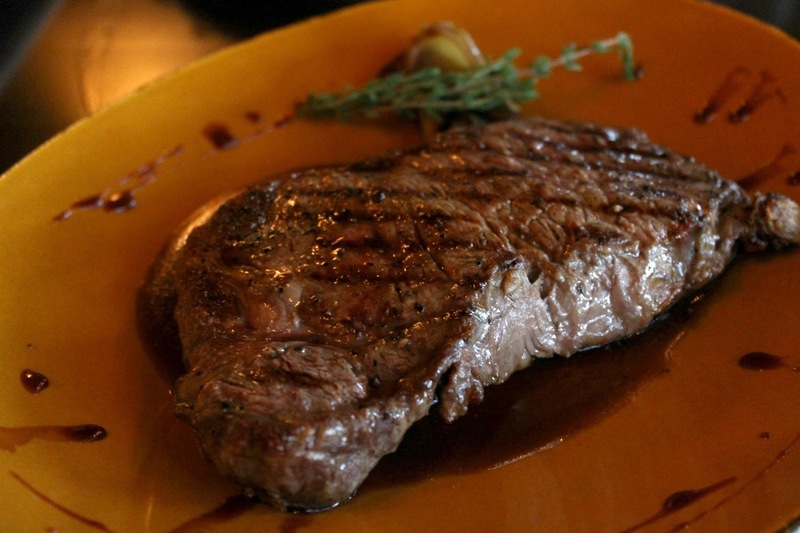 The Prime NY Strip comes in two sizes, 13oz ($47) and 16oz ($52). The steaks at Innisbrook are al a carte so we chose a loaded baked potato ($7) and herb grilled asparagus for our sides. The potato was a DIY, which I really liked, so I could control the amount of butter, sour cream, cheese, and bacon. The potato was perfectly tender in the middle with a great crisp to the skin. The herb grilled asparagus ($12) were GIANT. That is a normal set of tongs for serving. They were also perfectly cooked. Although we were stuffed, when the dessert menu made it's way around, there was no way saying no. They had a hot chocolate truffle cake ($8.50) served with vanilla bean ice cream, It was the perfect ending to our amazing meal. 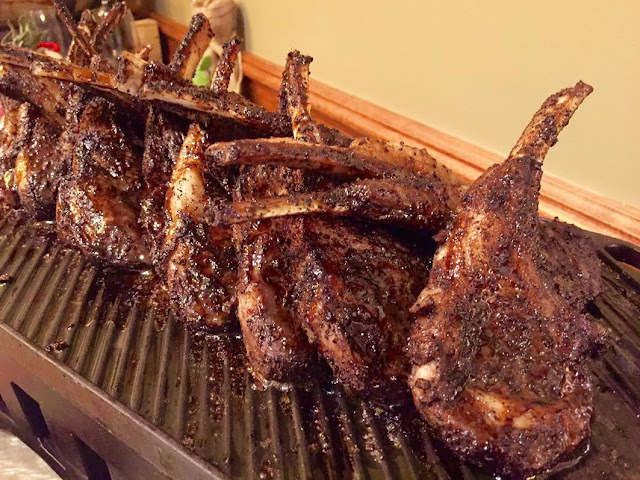 Remember those lamb lollipops? Here they are from my press trip a few months ago. I couldn't talk about them twice without showing them off! These are served with 3 chops ($28) or 6 chops ($52). As part of Innisbrook Golf Resort's 100 Days of Summer Food & Fun, you will find a variety of amazing specials at Packard's Grill. Hours of operation vary slightly throughout the year; please call to check availability. My husband and I were honored to be guests of Innisbrook Resort. As always, all opinions are my own.